PASADENA, Calif.—In a full house at Pasadena’s Ambassador Auditorium on Sunday, March 26, the theme, “Sounds of the Diaspora, An evening of symphonic interpretations of timeless melodies,” emerged repeatedly throughout the Armenian Pops Orchestra concert, magnificently conducted by Maestro Greg Hosharian. 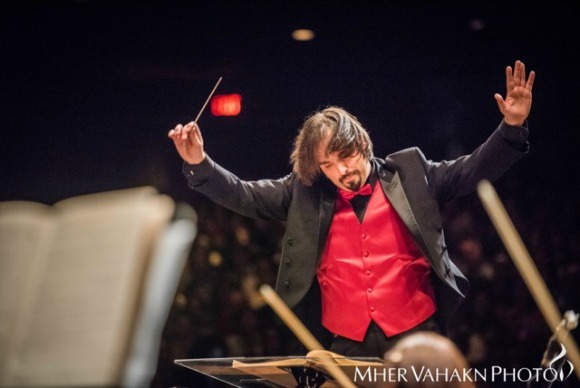 The program highlighted a full orchestra with vocalist Ayline Amirayan, pianist Siranush Sandaldjian Modrek, and guest conductor Tigran Arakelyan, a 2013 Edward Hosharian Scholarship recipient. A variety of music spanning many genres was performed, including Reinhold Gliere’s “Russian Sailors’ Dance,” Mikis Theodorakis’ “Zorba,” and Ara Gevorgyan’s “Artsakh.” “The Legend of Boto,” composition of Alexey Kurkdjian, a composer whom the Maestro met on-line, made its premiere performance at this concert. Also included in the program were “Triumph,” arranged by Edward Hosharian, and “Kinto Suite,” arranged specifically for the evening by Hosharian. Hosharian, much like his late father Conductor/Teacher/ Composer Edward Hosharian, to whom the concert was dedicated, tutored the audience throughout the performance. He transported them across the world to Greece, the Middle East, Armenia, Georgia, Russia, South America, and the USA. A number of instruments were spotlighted– the bouzouki, dhol, violin, guitar, and piano. Greg’s signature style is the blending of classical, ethnic, jazz and rock, appealing to many audiences. Proceeds of the event were used to endow the Edward Hosharian Scholarship Fund. The recipient of the 2017 Scholarship, Saro Babikian, a Classic Guitar Performance major at USC, was introduced to the audience by the Master of Ceremonies, City of Glendale Councilman Zareh Sinanyan.